Despite hip-hop’s history of increasing the visibility of black and Latino urban youth culture in America, it’s also struggled to include all minorities in the movement. Asian-American artists have struggled to find acceptance, even as hip-hop music found mainstream, commercial success on the global stage. Director Salima Koroma’s interest in this excluded minority group motivated her to turn her camera on four rappers attempting to pursue their dreams of expressing themselves through music and lyrics…each from their own unique backgrounds and vantage-points within the industry. In her feature documentary, she follows rap battle champion Dumbfounded, wild man Rekstizzy, the religiously devout Lyricks and feminist comedian Awkwafina on their journey. Lesley Coffin: When you started down the road of this project, profiling these four artists, did you have an idea why they hadn’t broken-out yet, and why we haven’t seen an Asian-American breakthrough in the mainstream marketplace? 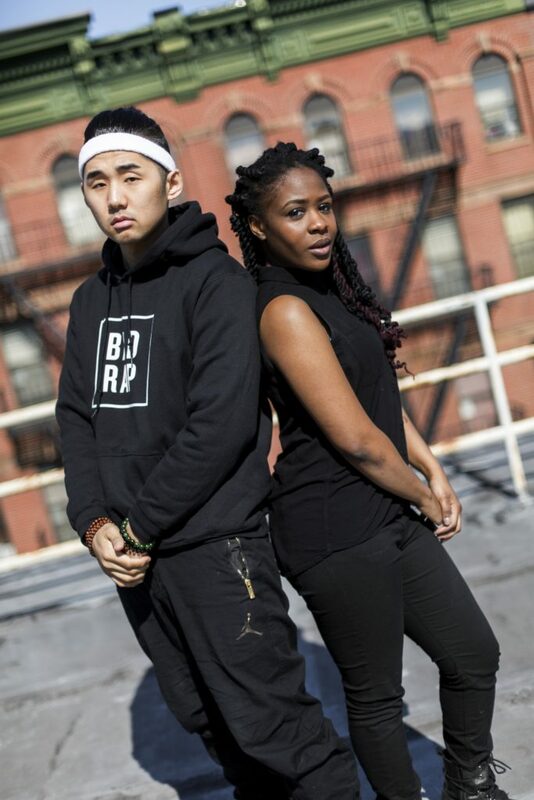 Salima Koroma: Well, they’ve certainly found their audience, and Dumbfoundead and Awkwafina are certainly close to breaking through. But this is just an example of how Asian-Americans, particularly Asian-American men are underrepresented and stereotyped in our culture. Hip-hop, or what it’s been stereotyped to be, is contrary to what Asian-American men are stereotyped to be. I think that might be one of the major reasons. And there hasn’t been the Eminem who is really good and can break into the mainstream. I certainly have my opinions of why we haven’t seen Asian-Americans on TV or the radio, but the subjects have their own ideas they express in the film. Lesley Coffin: I want to touch on this idea on the dichotomy between stereotypical Asian-American men and hip-hop culture. All three guys are completely different in terms of personality and their stance on masculinity. Salima Koroma: The stereotype, particularly in America, that’s been breed in history that Asian American men are quiet, docile, are effeminate. And mass-media particularly has been guilty of that feminization of Asian-American men. That perception is the opposite of what we have in hip-hop, which is seen as hard and confrontational. It’s aggressive, and so they don’t seem to match up in people’s minds. I don’t know when that popped-up or why, but you can see it in Bugs Bunny, Breakfast at Tiffany’s, William Hung in American Idol. The three guys in this film, Dumbfounded, Rekstizzy, and Lyricks, don’t fit into that perception, and they have very different personalities from each other. As we all do, that’s human. Lesley Coffin: The people in the film, the money guys and tastemakers, are an interesting. Did you feel like these were the people who needed to change their expectations and vision of what hip-hop is and what rappers look like, before we will see an Eminem type arrive? Salima Koroma: I love that question, because one of the most interesting things I found out during our interviews with people in the industry is, a lot of the music they play on the radio isn’t the music they enjoy or the music they play at home or in their cars. So we had a DJ interviewed, and he admitted that none of the music he plays on the radio is the stuff he’s listening to. So it’s really going to have to depend on the audiences demanding to hear these voices on the radio. There was an article posted after the film premiered, and I saw so many commenters, not people who’ve seen the movie, saying I don’t care about Asian-American rappers or commenting that they looked weird. So opening the minds of the audiences are so important. I don’t want to say they’re the most important, but it’s a combination of the rappers finding their audiences and hip-hop audiences opening themselves up to the possibility. But if the rappers come correct, I think audiences will be more to them and those gatekeepers will be more willing to push them. Lesley Coffin: I was so interested in Awkwafina’s story. It was fascinating to male rappers claim she had an advantage and finding an audience because she’s a female, and so many people who were fans saying they liked her music because it was funny and clever. When you were doing interviews with the other rappers, how did you respond to what they were saying about her? Salima Koroma: When we had those conversations, they were happening at the very beginning of shooting, the start of the film, and they were talking about how she wasn’t going to make it or fizzle out. And things have obviously changed even while we were making the film. But when we talking to Awkwafina, she was doubting herself, questioning if she was a gimmick or that she wouldn’t be the stronghold in rap that Dumbfoundead is. And now, she’s realized that she can do music, but she isn’t just music. She can perform her own music, she can produce, she’s acting, she’s a comedian, and she’s creating her own image. And if that’s of a funny woman, a feminist image, she’s able to take that image and use it to do all these other things. She’s making movies, writing books, doing her music, so they can say whatever they want about her, but she’s succeed in ways they still haven’t. Lesley Coffin: In the past four and five years, we’ve seen a big shift in the music industry of how it’s being consumed and monetized. People can have hits with an online video that will never play on MTV. People are subscribing to music services rather than listening to FM radio. Did you see a big change in the industry while filming? Salima Koroma: We started filming in late 2012, and I don’t know the business specifics, but like you said about MTV… it’s irrelevant now. MTV, BET, VH1 aren’t the dominate outlets they once were, because people have Youtube, Twitter, Snapchat, Instagram, all these ways to personally market yourself and build a brand. Ten years ago, the landscape was completely different. They have the ability to push themselves and make themselves visible. 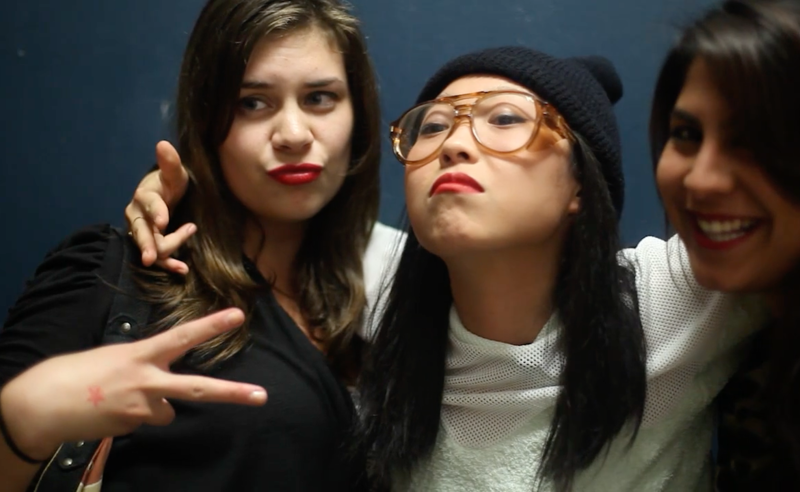 When Awkwafina’s “My Vag” went viral, that was so cool because it was a do it yourself video. She didn’t have to wait for MTV to play it. Lesley Coffin: It’s so unnerving for someone unfamiliar with rap battles to see how quickly the competitors said things that could be perceived as racist. Did that surprise or upset you? Did you know how common it was? Salima Koroma: I wasn’t surprised at all. I asked Dumbfoundead the same question and he said, when you’re in a battle, you’re trying to point out anything to embarrass them or point out to the crowd. You look at him, he’s an Asian man, and for a fellow rapper not to jump on that, it would almost seem irresponsible not to jump on that. And if the audiences are still reacting to those comments in such a big way, they’ll keep doing it. I wasn’t surprised, but the way I see those things now have changed. Talking to so many people about the stereotypes of Asian-American, I’ve open my eyes. I might hear a joke about Asians and turn a blind eye, but now I’m so much more sensitive to those things, and it’s jarring to me. Other people aren’t sensitive to it, people who aren’t reacting because they don’t even take it in. I notice when someone says something racist or insensitive or offensive and people don’t see it that way, even if they aren’t encouraging it. I cringe at the rap battle in the movie now, I don’t like the behavior I see. Bad Rap will be available on VOD May 23rd.